We had time to spend at Chanctonbury Ring, an evocative place, just before the drop down to the A24 where Barbara would meet us. Some children playing near us at the Ring lost a tennis ball which we later found and kicked all the way down the hill – and so returned it to some very surprised owners! We averaged well over two miles an hour for the first time. If nothing else, the walk plots Matthew’s growing physical maturation – he is now 11. No doubt in a few years another walk will plot his father’s decline! (Fast forward 14 years to Cornwall.) Near the close of this walk, from Rackham Hill, is one of my favourite views in all England, looking across the Arun valley to the very different wooded downland above Chichester, where I went to school. The direct route is eleven miles – quite a hike for many adults. We chose to break the walk at Gumber bothy, a National Trust camping barn at an isolated farm one mile off route. The track to Gumber from the SDW at Bignor Hill is along the old Roman road of Stane Street – Matthew enjoyed following in Roman footsteps, ‘leftius rightius’, and indeed the whole overnight experience (boosted by our evening barbecue). Much of the second day was through woods, where we estimated Matthew’s stride length – a very creditable 67 double strides per 100 metres: mine is 57 to 60. The walk, nearing the end of Sussex now as Matthew nears 13, continues through one of the least populated parts of south-east England. 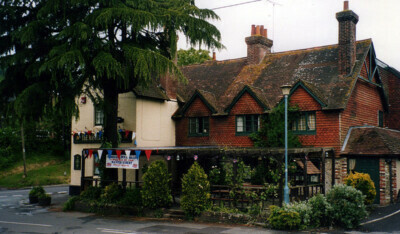 There are a few hamlets at the foot of the downs, and a few more hidden away to the south, but none more than a few houses until the Way comes close to the village of South Harting – big enough to boast (then; not now) two pubs and a few shops. First, a short step to Buriton in which Matthew, now 13, showed off how fast he could walk. Nothing his dad couldn’t cope with though. We stayed overnight at the Master Robert Inn so we would be well placed for tomorrow’s long day. There was a big village celebration at the squire’s house – just like old times. It wasn’t for us, alas. 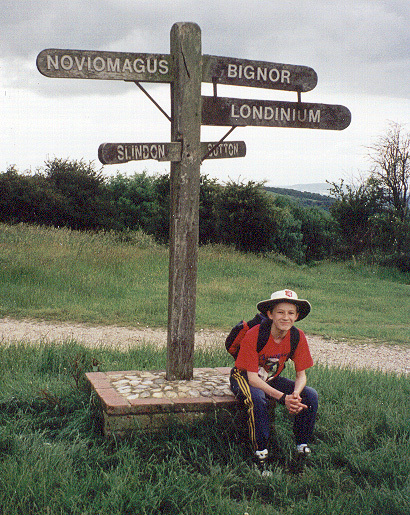 At Matthew’s age I knew the West Sussex downs well, but barely ever strayed over the border. So this was new country to me. 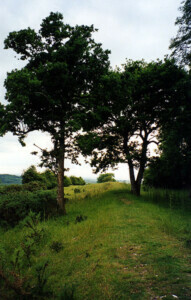 The county boundary is in the right place, for the Hampshire downs have a different feel to those of Sussex. The clear scarp slope is gone, after some seventy miles. This stage still has its unity though: it is essentially three hills, first Butser Hill, then the ridge around Wether Down, and finally Old Winchester Hill. Different to Sussex, but equally as good. Matthew, 14, has spent half his life walking the 100 miles from Eastbourne; now, on a sunny summer’s day, it is all over. There’s a sharp climb soon after Exton, where Matthew is still some way behind in the heat, but that quickly passes. With a fairly late start that day thanks to the infrequency of the bus from Petersfield, the Millbury’s Inn comes at the right time for lunch; it is perhaps the best pub on the whole Way. Oil drilling is a surprise, but it it is nothing to the great despoilation of the motorway driven through Twyford Down, so apparent at the last. But the green by Winchester Cathedral is a place of resort on a day like this, and it’s all smiles for the final photograph.